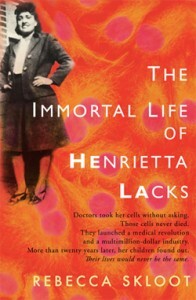 The Immortal Life of Henrietta Lacks, by Rebecca Skloot, is the best nonfiction book I’ve read in a very long time. It’s an amazing, complex story told with remarkable skill by a narrator you feel you want to know. The old cliche came true for me: I was sorry to see it end. It’s the story of a young African-American woman who died in 1951, but whose cells were cultivated, stored and eventually shipped all over the world – and into outer space – because they had a remarkable ability to replicate and survive in testing environments. Her family didn’t know any of this was happening until years later, when they learned that their mothers’ cells were being bought and sold, creating fortunes for private companies, while they – the family – couldn’t even afford health care. Rebecca Skloot weaves together multiple tales, exploring the history of medical experimentation on minority groups, skillfully explaining scientific principles and drawing an incredibly vivid portrait of Henrietta Lacks’ colorful family. I loved watching how she gained the trust of people who had no reason to trust her, and how she found her own life being transformed by knowing them. I’m writing this quickly, so I’m not really doing the book justice here. But if you’ve seen this book around and had any curiosity at all about it: read it. I read it as slowly as possible, savoring the storytelling for as long as I could. You won’t regret the time you spend on it. Also, Skloot has put up an extensive website with photos, videos and other backstory info; that’s worth checking out too. I’ve been seeing articles about her recently – I find her story haunting. I didn’t realize that there was a book out – I’ll have to check it out. Thanks LP! I am super excited about putting this on my reading list! Thanks!